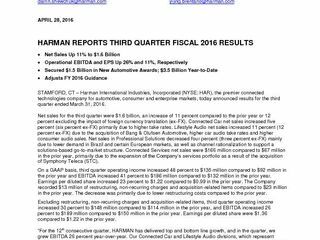 STAMFORD, CT – Harman International Industries, Incorporated (NYSE: HAR), the premier connected technologies company for automotive, consumer and enterprise markets, today announced results for the third quarter ended March 31, 2016. Net sales for the third quarter were $1.6 billion, an increase of 11 percent compared to the prior year or 12 percent excluding the impact of foreign currency translation (ex-FX). Connected Car net sales increased five percent (six percent ex-FX) primarily due to higher take rates. Lifestyle Audio net sales increased 11 percent (12 percent ex-FX) due to the acquisition of Bang & Olufsen Automotive, higher car audio take rates and higher consumer audio sales. Net sales in Professional Solutions decreased four percent (three percent ex-FX) mainly due to lower demand in Brazil and certain European markets, as well as channel rationalization to support a solutions-based go-to-market structure. Connected Services net sales were $166 million compared to $67 million in the prior year, primarily due to the expansion of the Company’s services portfolio as a result of the acquisition of Symphony Teleca (STC). On a GAAP basis, third quarter operating income increased 48 percent to $135 million compared to $92 million in the prior year and EBITDA increased 41 percent to $186 million compared to $132 million in the prior year. Earnings per diluted share increased 23 percent to $1.22 compared to $0.99 in the prior year. The Company recorded $13 million of restructuring, non-recurring charges and acquisition-related items compared to $23 million in the prior year. The decrease was primarily due to lower restructuring costs compared to the prior year. Excluding restructuring, non-recurring charges and acquisition-related items, third quarter operating income increased 30 percent to $148 million compared to $114 million in the prior year, and EBITDA increased 26 percent to $189 million compared to $150 million in the prior year. Earnings per diluted share were $1.36 compared to $1.22 in the prior year. 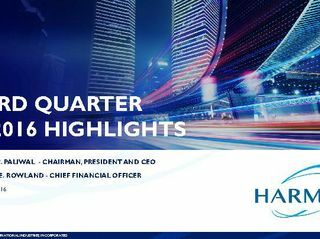 “For the 12th consecutive quarter, HARMAN has delivered top and bottom line growth, and in the quarter, we grew EBITDA 26 percent year-over-year. 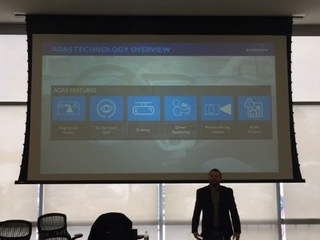 Our Connected Car and Lifestyle Audio divisions, which represent approximately 75 percent of our revenue, continue to deliver strong results. In our Professional Solutions division, we are taking decisive actions to improve performance and better position HARMAN for growth,” said Dinesh C. Paliwal, the Company’s Chairman, President and CEO.